What's in the fine print of those travel agreements? In just about every aspect of life these days, there's a written agreement that contains a lot of fine print few of us ever bother to read. We should. Not only could it keep us out of trouble, it might even save us a lot of money, especially when traveling. Travel appears to entail a lot of fine print in agreements, from airlines tickets, to rental cars, to credit cards. The editors at CheapFlights.com, a travel site, recently pored over all the fine print they could find when it travel. It was enlightening reading, to say the least. 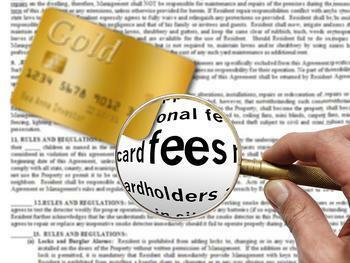 For example, the fine print in your credit card agreement may extend a lot of travel benefits you didn't know you had. Many, but not all, cards provide limited forms of travel insurance. For example, some cards will reimburse you if you book a trip but have to cancel it for good reasons, like getting sick. Most cards offer at least secondary insurance coverage on rental cars. It's usually limited to damage only, but that can be a benefit because if you have a fender bender, the credit card company takes care of it and you don't have to file a claim with your auto insurance provider -- a claim that almost certainly will result in higher rates. When dealing with an airline, read the fine print about cancellation fees, which just about every airline now charges. CheapFlights.com says it found airlines typically allow you to cancel your reservation at no charge, if you do it within the first 24 hours. Almost all airlines charge rebooking fees, but you usually don't have to pay them when the airline cancels a flight, especially because of bad weather. That information is in the fine print. If you book your flight well in advance, keep track of the fares on your flight. Very often they go down. CheapFlights says some airlines will refund the difference if you ask them to. Again, you wouldn't know that unless you read the fine print. What about when your luggage, or its contents, are damaged during the flight? The airline will usually pay, but how much will be spelled out in the fine print. Airline overbooking has been a hot topic since that incident in Chicago last month when a passenger was forcibly ejected from a United Airlines flight. If you are bumped, or voluntarily give up your seat, the airline will compensate you, and the potential amount will be spelled out in the fine print. Learn more in the ConsumerAffairs Travel Insurance Buyers Guide.